In classical computers, data are rendered as binary bits, which are always in one of two states: 0 or 1. However, a quantum bit (or 'qubit') can exist in both of these states at once, a condition known as a superposition. A qubit operation exploits this quantum weirdness by allowing many computations to be performed in parallel (a two-qubit system performs the operation on 4 values, a three-qubit system on 8, and so on). A Nobel Prize for Physics must be around the corner. If the Australian Government had any brains, it would insist the chips and computers be made in Australia and the technological output of this breakthrough be used there first. There's probably some stupid clause in one of those free trade agreements which might stop this happening. The timely solutions to intractable problems could be worth more than the sale of the hardware. Just think about optimising scheduling for global transport operations. Lets see them factor 221 with it then? If a multi qbit array can factor this into two primes (13x17) near instantly on a single chip then the computer world will take notice very rapidly, as all domestic encryption depends on the difficulty of factoring larger primes. The 8 bit examples of primes multiplied should be an excellent demo of what quantum computers should do readily. The algorithms are waiting for the hardware. You can search for "A Two Qubit Logic Gate in Silicon", a paper. Thatpaper describes a similar scenario of a 2-qubit network, or multiple 2-qubit logic gates linked to form a quantum computer. In that paper, it describes how they believe it is possible using what we have here (pure silicon as your base to put you logic gate on) to amass over 100 of the two-qubit gates to form a usable quantum computer. The video has the scientist stating millions of them, but I haven't looked for a paper that says that. @docile: The transistor in a classical computer is designed under the assumption that you can treat the electron as a particle most of the time. Quantum based computers design the basic computational component by utilizing the particle/wave duality of matter and all the fun that goes along with that. Quantum based computers and classical computers are used for different applications as mentioned in the article. There is no proposed switch from classic to quantum in this case, these computers are meant for applications where classical computers have difficulty solving problems in any reasonable amount of time. @qitana I think D-Waves current quantum computer uses 512 qubits. Noise is a huge problems with these machines from what I have read. From what I am reading and the paper I posted in my previous post and others today, a 2-qubit logic gate is sufficient and I believe the minimum to form a universal quantum computer. And I think that the team at Sydney has performed a significant advance in placing the logic gate on a pure form of silicon at each gate, which from my understanding makes for stable computations. The other article I read developed a scenario with quantum dots on the same form of pure silicon and their research says they could link over 100 of those quantum gates to perform reliable quantum computations. There is no mention of quantum dots in this article, might be wrong, but I see no problem from the other article that they can't link 100 in a completely stable way, which in my opinion would lend credence to the scientist talking about significant advances in healthcare and materials science. I'm hoping this gets used to develop neuromedicine and medicines for metabolic disorders, but let's be real about it. It will probably get used to manipulate the false economy through the stock market, and of course make better weapons for killing people. We can only hope that muslims are never allowed access to quantum computing technology. There needs to be some sort of universal U.N. ban on muslims using Quantum technology, as well as a constitutional amendment in the U.S. doing the same. We can't have these lunatics developing weapons or computer hacks that could ruin what's left of western civilization. I'd like to see a computer calculate which race is the best in Starcraft 2, given the same number of actions per minute for each race. Like calculate it for each increment of 50 actions per minute ranging from 50 to 400, and for each of the cross-race matchups to see which race is in face objectively the best. The reason I say they should be limited to the same actions per minute is because I define game balance as "equal effort provides equal results and equal opportunity to win". Strangely enough, Blizzard and most of their fan base do not seem to define game balance that way. @Returners: I hope you are not being serious. If you are you have some serious racism problems. You are demonizing a group of 1 billion people for the actions of a relatively small number of extremists. The first article you linked to doe not demonstrate the point you are trying to make. It just shows the DWAVE-one is not as useful as the company claims. The second article you linked to is not about using indeterminism. It is pointing out well known thing in engineering should be applied in computing more. Approximate where you can and only be precise when you have to. It basically breaks down to them saying hey guys you know you can approximate 3.1 to 3 for many applications without it mattering. The method you posted for encryption is interesting. The article does not say they have the same limits. It just shows that classical physics can also be used to create an unbreakable encryption. I'll never forget the videos of all those "moderate" muslims dancing in the streets celebrating on 9/11/2001. Race has nothing to do with it, as the evil religion of islam has spread it's festering cancer to every race in the world. You can't afford to be so naive. Oh yeah, *cough, cough* they get it from the "moderates" donations to their organizations. You are one, very deluded individual. You can't afford to be so ignorant in this day and age. Firstly, why even bring up religion here? Secondly, don't forget that it was the very Muslims you are vilifying who ensured this research could take place...hundreds of years ago when they saved Greek works from destruction and added their own scientific breakthroughs in math, optics, physics etc. Quantum techniques have been demonstrated to offer improvements in areas such as computing, cryptography, and information processing, among others. 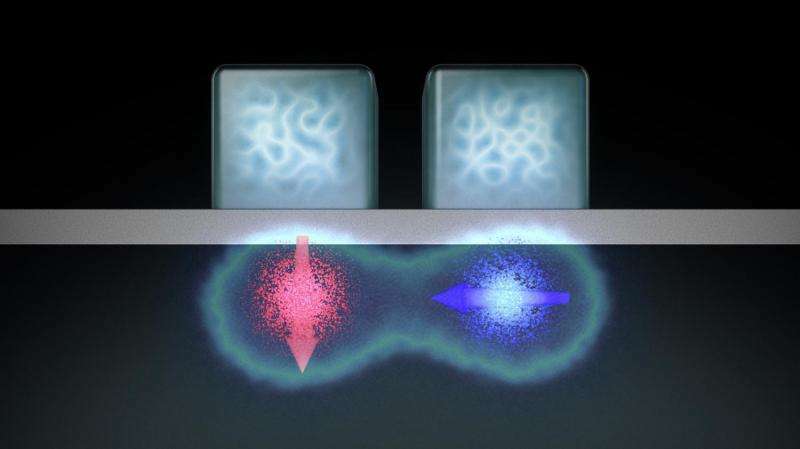 But in a new study, researchers from IBM have proven that no quantum trick – no matter how complex or exotic – can improve the capacity of a type of quantum channel that serves as a building block of quantum optical communication systems. They are talking about a communications channel not computing. They do state that quantum techniques offer improvement for computing. The DWAVE implementation is limited by noise and is not a general purpose processing unit. The article here talks about the building block of a general purpose processing unit. @docile: If you try running a regular computer at a fraction of a kelvin it will not work. A field effect transistor cannot function at that temperature. It will cause all the charge carriers to freeze out. @docile: are you just copying and pasting statement you see posted around the internet? Gustav Kirchhoff was the first to describe conductive sheets, in an 1845 paper that laid the groundwork for two now-famous laws governing circuits. Kirchhoff realized that a two-dimensional conductive sheet was far more complex than a circuit and potentially could be used to compute the solution of various differential equations. That is verbatim from another website. Actually the math is different for computing and communications. One example is communications cannot be an adiabatic process, yet computing can be. The best example I know of for applying quantum computers is in computational quantum chemistry. Quantum computing is best for simulating the quantum world, which we require for many applications. The point of quantum computing is not a faster processor (clock wise), it is about solving problems with variables that depend upon each other. In the case of quantum computing entangled qubits allow for this. You do understand the DWAVE machine is not a great example of quantum computing, right? The people in the field of quantum computing do not expect a generalized processor to be realized until the 20s. The timeline for quantum computing is not based on the rate of progress of other computing methods. It is based on technological progress and fabrication technology. It is a completely different way to compute, which makes it best suited for certain problems that traditional ways to compute cannot do well. The traditional ways to compute do not utilize superposition and quantum entanglement to solve problems. The only think new processors will do is utilize quantum effects to make better switches, like the tunnel fet. don't forget that it was the very Muslims you are vilifying who ensured this research could take place...hundreds of years ago when they saved Greek works from destruction and added their own scientific breakthroughs in math, optics, physics etc. Virtually all development in any of those areas was done by Babylonians (not Muslims), Greeks, Romans, and other Europeans all the way up to and past Newton. The "Muslim" contributions include some trinkets and a few machines which were actually already known and used in construction projects and other purposes several thousand years earlier by the Jews, the Babylonians, and the Egyptians during the reign of the Pharaohs. Islam doesn't contribute anything. It mostly just steals and destroys. 65% of Nobel winners self-identified as Christian. You'll never be able to make a general purpose quantum computer which lives up to the theoretical ideal computational limit of quantum theory. in order to get close to the theoretical limit you would need a machine specifically designed for solving the problem you have in mind; for example, solving the game of chess for the best possible game assuming both players always make the best move, and play to win, up to a forced 3 fold repetition, and of course doing this solution in the fewest number of total calculations. Well, classical computer algorithms attempt to do that, but quantum computer algorithms are supposedly (theoretically) able to solve this in far fewer calculations...in an ideal scenario. The theoretical mathematical advantage to the quantum computer depends on the type of problem you are attempting to solve, and the type of quantum computer you are using. however, the claim of a QC being able to do infinite calculations, etc, etc, is BS. There was a Stanford University lecture a few years ago where the professors had worked out the exact theoretical advantage of a quantum computer on certain classes of problems, and the advantage was in fact huge, as in exponential, but finite. In addition, if you wanted to use quantum computing for sorting and searching databases you would need to design the database to be used in that manner, and it will not necessarily work any faster (to the end user) than the existing indexing methods used in classical computers, for example by Google and other search engines. Again, it will depend on the situation. In some situations it might save you a lot of time, and in others it might not make a noticeable difference. The real issue is that there are certain classes of calculations which supposedly cannot be done on a classical computer at all, which I doubt for reasons I'll specify later, and the quantum computer can supposedly solve some of these problems relatively quickly. Basically, it ought to be possible to simulate qubits on a classical computer, and therefore simulate a quantum computer, with much fewer qubits than the number of bits the classical computer has, and do quantum computation by simulation. Because a classical computer can theoretically model any mathematical construct, the model in this case would just run slower than a normal, physical quantum computer. it would be like an emulator or virtual engine. @docile: I think you are confusing quantum phenomena with quantum computing. Just because quantum behavior is there and being used does not make it quantum computing. Quantum computing is utilizing a qubit that has the capability to posses multiple states simultaneously (superposition). This can be a 0 and 1 or it can be increased to be more than binary. Logic gates can then be constructed to manipulate the qubits. Exactly and your previous two comments are right on. Its not that the problems cannot be done on a classical computer, it would just take an unreasonably long amount of time. I still cannot believe you insist on those racist comments. You need to get to know more Muslims, the majority I know are good people. I personally dislike all religions and think they are more harmful than helpful. This is not the place to discuss it though. You are clearly confusing quantum phenomena with quantum computing. Your statement makes this more clear. Quantum computers use qubits that can be a 0, 1, or both. That both is an important aspect of quantum computing. I believe the logic gates will be the same. Neural networks: These function similar to the human brain. They are much more similar to an analog computer, but more general purpose. Analog computing: This class of computing is too application specific to be useful. You supposedly see it in some applications. DNA Computing: I am not familiar with this one. Computing types are based on the math behind it not the physical system. The computer system is designed to do specific mathematical operations and then we attempt to formulate our real world problems in ways that those mathematical operations can be used. I believe the real nut to crack is not compensating for quantum uncertainty, but utilizing it effectively. Classical computers deal with a low ratio of errors in data, which is dealt with by checksum. When you look at the probabilistic nature of quantum objects you should readily see that a much more involved system of error checking is required. As a simple example you could use 3 quantum bits to represent 1 classical bit of data and use a "2 out of 3" verification. That is what I am curious about related to this article, what is the error rate on the silicon q-bits? @jerromyjon: The issue in not with uncertainty, it is with quantum coherence. You need your qubits to hold their states, but these states are easily disturbed. From my understanding there is no way to use this to an advantage. People just have to figure out how to maintain coherence of the qubits and correct the system when coherence is lost. You could just do the calculation many times to improve accuracy, but as the complexity of the computation increases the probability of one qubit to lose coherence in the chain of computation is going to approach 1. Docile, in my opinion which does not count for much, you are not entirely correct. Quantum annealing is not classical computation, and although conductive sheets can be treated mechanistically as fascinating computation devices, they are not equivalent. The trick with quantum annealing is representing the problem space so that there are local minima for the space fetched and also being capable of fetching a subspace to represent without disturbing the "game board". You are correct that without the mathematics it's complete folly. Hilbert computing devices are on the way. As is more advanced mathematics beyond imaginable processes.